Hello how do i fix my cast bar i have to use v3.52 because the word is just out of sync with the cast bar in 3.53 and 3.54 thanks. Tout d'abord je suis un grand fan de votre travail fait avec cet addon, mais depuis la dernière mise a jour faite sur le jeu l'addon ne fonctionne plus il me met que des message d'erreur en boucle malgré qu'il soit a jour pouvez vous m'aider s'il vous plait ? Please update ElvUI to it's latest version. Just a request: because I'm old and blind, so to speak, I have my minimap set to 250x250. The (professions) dashboard(s) only go(es) to 220. I edited options.lua to change the max width, but, of course, that'll be reset the next time you update. Any chance you could set those three values a bit higher by default? The other dashboards are on lines 387 and 470, if you do change it and want to keep it consistent. Either way, thanks, again, great stuff! UI gods have listened to your request and it has been added in BenikUI dev version. If you cannot wait for the next release, then clicky. You won't lose your settings. first of all, nice work, the userinterface looks really amazing! 2) and 3) at the installation when choosing between Classic Layout and v3. When I open the ElvUI config box, there is nothing there. It's only showing the Install button and the Anchor buttons at the top. No other options on the sides show up. Re download ElvUI. Make sure that both ElvUI and ElvUI_Config folders are in your interface/addons folder. 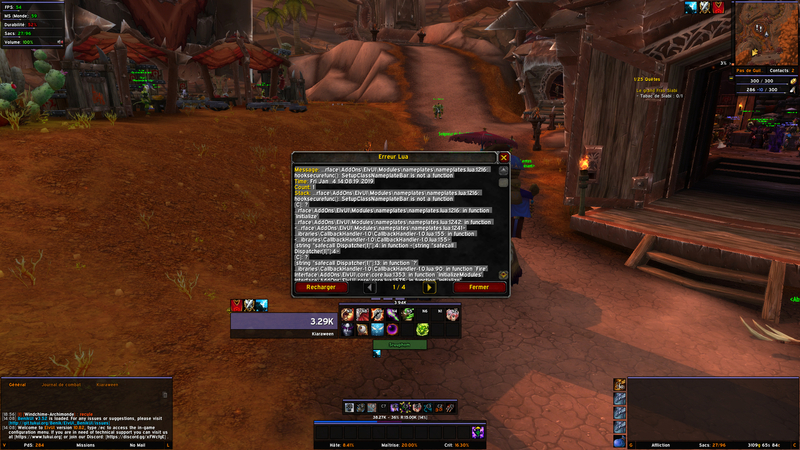 So what i try to say is, i cant be sure its not one of the other addons that is making conflict this time. Ok all the things in the spoiler was fixed in the new version 3.40, but i do still get this error, it happen right when i press "H" key, for Player vs Player (off Season) frame. Im not sure why, but every time i login i get the "land at next flight path" popup, its blank with the V down in it. and i have to click it to get it to go away. It's fixed in v3.41. Please update and thank you for the report. Addons are stored in a different folder than their settings, so updating any addon won't reset it's settings, unless it's author decides to do so. Something else might be wrong, sorry. Update to v3.39. It should be fixed. Quick question How can i deactivate flight mode. i try looking for the option in misc. but i could not find it. The problem i have with flight mode is that once i end the travel the mode is bug i cant exit unless i reset the ui ( also the flight mode dont let me open map or anything. first image flight bug, second bug after travel end.